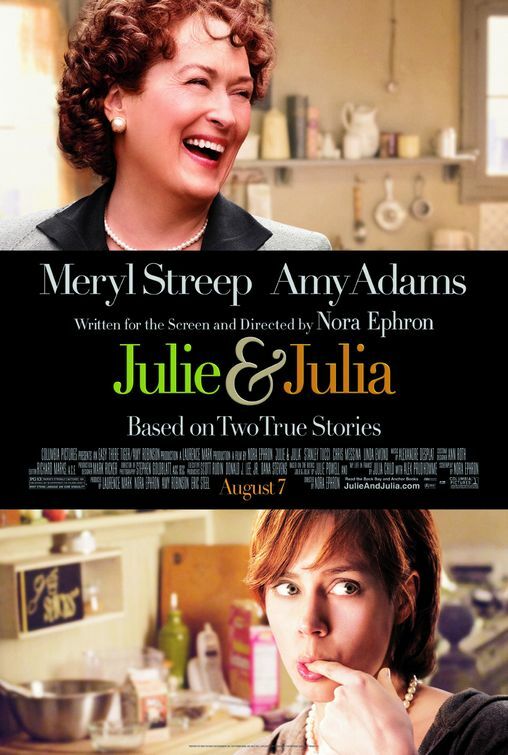 I’m flying from London to LA and just finished watching that delightful film- Julie and Julia. It’s been a long time since I’ve watched a movie and laughed AND cried AT THE SAME TIME. Oh the parallels were too close to home! You see just before boarding the plane I was Skyping my little sis back and forth, as she was feeling lost in the “passion-infused-hobby-becomes-business” sea. I know the feeling – I’ve been there myself. I remember all to clearly how when I first started “doing what I loved for a living” I lost myself in the love of the work, and at times I lost my mind! At that time it was my little sis who held my hand and took me shopping for “care food”. We went to her local food store and bought ingredients for a muesli slice, pita pockets and the ingredients for a homemade hummus. She cut up carrot sticks and packed my lunches for three days in advance and gave me the ultimate sisterly advice: “Take care of yourself please”. And now she finds herself in a similar place. Founding mother of a super-fast growing, heart-based business feeding the foodies of Melbourne. Its a place that all fledgling passioante entrepreneurs find themselves in in the first 12 months if they meet with early success. Your lifestyle takes a severe hit, as the lines between your business and your life blur and blur until you forget where one stops and the other begins. All this is fine- unless you are focused to the point of forgetting to eat, forgetting to drink, forgetting to go outside in daylight hours for weeks on end, and forgetting that you have a husband, wife or family who loved you even before you started your business. Watching both Julie and Julia, and my sister Kath go through all this, I am reminded of that time in my life a few years back where the passion burned so hot I was like a bushfire. Leaving behind a wake of destruction. But like a bush fire, once the fuel is burned out, it slows, and a cool rain will eventually extinguish the embers. And soon enough, irrepressibly, the new life shoots from the charred trees, green-ness descends once more, and the cycle continues. Are you burning like a bushfire, or a hearth fire? There is an opinion among Australian environmentalists that it is precisely because we do such a good job of preventing bushfires (a perfectly natural phenomenon) that when they do occur they are so MASSIVE and UNCONTROLLABLE. If we (well-meaning but control-freak humans) hadn’t come along, fires would burn, and burn out, and the cycle of life would continue. Perhaps it is the same for the heart-based entrepreneur. Perhaps we are destined to go through our fires, our passion burning hot. And then to burn out, and rejuvenate. The trick is catching ourselves before our health and relationships burn out. And perhaps it is for this reason we surround ourselves with family and friends who care. Like my sister was there to catch me a few years back and bake a muesli slice, it is now my turn to be there for her. To remind her to go take a bath, shave her legs and do her nails. To go have that massage, walk by the river and smell the eucalypts. Smell the roses, just try not to singe them! Very nice post Joanna, great insight and interesting to see the evolution between the roles of you and your sister. thanks for this article! it was a very interesting read and left me with a lot to ponder!